Chaos erupted on the YouTube campus in San Bruno Tuesday afternoon when an alleged female shooter entered the campus and opened fire. 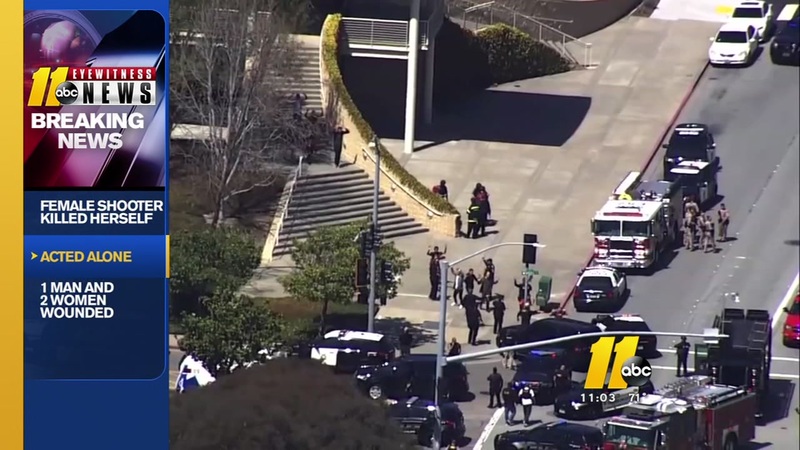 SAN BRUNO, California -- Chaos erupted on the YouTube campus in San Bruno Tuesday afternoon when an alleged female shooter entered the campus and opened fire. San Bruno police said she wounded three employees before killing herself. Sources tell KGO-TV in San Francisco that the YouTube shooter was a user of the platform. Nasim Aghdam has an alleged website with a manifesto that targets YouTube for censorship and demonetization of her video content. San Bruno police later confirmed Aghdam as the suspect as well. Aghdam is said to have no relationship with anyone in the YouTube facility. Sources said Aghdam did not have an ID badge but was carrying a purse. Nobody in the facility knew who she was. They added that Aghdam got off 30 or 40 shots before turning the gun on herself. According to her website, a possible motivation for the shooting could have been tied to her many YouTube accounts, which she says have seen a decline in viewership over the past few months. Police and witnesses say a woman opened fire Tuesday at YouTube headquarters in San Bruno, wounding three people before fatally shooting herself as terrified employees huddled inside. She embedded videos from the biggest YouTubers on the platform on the site, including massive creator Casey Neistat. In them, they talk about the YouTube "Ad-apocalypse" where many users are seeing massive dips in traffic, subscriber count loss, and de-monetization of videos. Neistat has more than 9,000,000 subscribers and made a famous video about the YouTube ad revenue share for creators. A shooting at YouTube headquarters Tuesday that wounded three people is being investigated as a domestic dispute, two law enforcement officials said. It appears that Aghdam was disgruntled by the changes in the YouTube platform. She wrote on her website, "Be aware! Dictatorship exists in all countries but with different tactics! They only care for personal and short-term profits and do anything to reach their goals even by fooling simple-minded people, hiding the truth, manipulating science and everything, putting public mental and physical health at risk, abusing non-human animals, polluting the environment, destroying family values, promoting materialism and sexual degeneration in the name of freedom and turning people into programmed robots!" She goes on to quote Adolf Hitler saying, "Make the lie big, make it simple, keep saying it and eventually they will believe it." The rest of her message targets YouTube and censorship. "There is no free speech in the real world and you will be suppressed for telling the truth that is not supported by the system. Videos of targeted users are filtered and merely relegated so that people can hardly see their videos." Aghdam's website shows screenshots of her "reduced" and "suppressed" videos. She referred to a specific video that appeared to be an instructional video for a workout saying, "This video got age-restricted after new, close-minded YouTube employees got control of my farsi YouTube channel last year, 2016, and began filtering my videos to reduce views and suppress and discourage me from making my videos!" On Feb. 20, YouTube enacted a new advertising policy that demonetized channels with less than 1,000 subscribers and 4,000 hours of watch time. Though Aghdam's main English channel had more than 5,000 subscribers, many of her videos appeared to be demonetized.